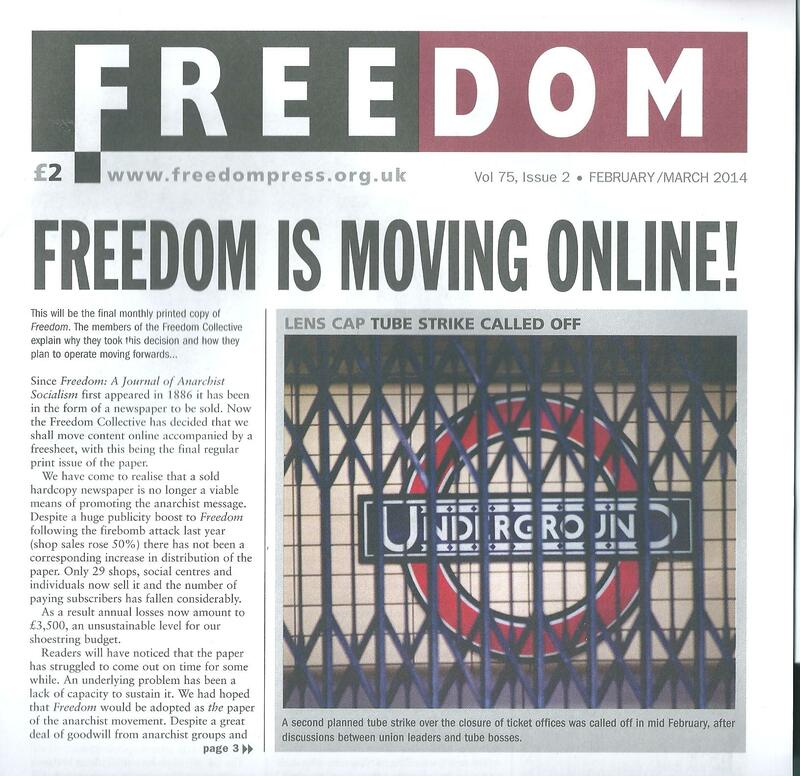 It has been announced by Freedom, arguably the longest running left periodical in Britain, that the March-April 2014 issue will be its last. The paper has been in trouble for some years. Now with a mere 225 subscribers, a print-run of about 1,000 and annual losses of £3,500 it is intended to produce an online version accompanied by an occasional free news-sheet. This is an odd situation since there must be a greater number of conscious anarchists nowadays than at any previous time in British history, while in addition there are many more natural anarchists, people who, though not identifying themselves as anarchists, think and behave in significantly anarchist ways. In 1886 Peter Kropotkin, who had lived in western Europe since 1877, moved to England and immediately founded Freedom: A Journal of Anarchist Socialism with, among others, Charlotte Wilson, a Fabian and the editor for a decade. It was published monthly as a sober and thoughtful journal, surviving while other publications appeared and soon folded in the tempestuous and often violent world of contemporary anarchist activism. Freedom had premises in Ossulston Street, Somers Town, from 1898 and the compositor Tom Keell as editor from 1913; but the dwindling of anarchism after the First World War led to its closure in 1928. Keell and his somewhat younger companion Lilian Wolfe withdrew with the stock of Freedom Press to the Whiteway Colony near Stroud, Gloucestershire. From Whiteway Keell produced irregularly fifteen issues of a Freedom Bulletin until 1932, but thereafter nothing. It was the Spanish Revolution and outbreak of the Civil War in 1936 which were to revive the fortunes of anarchism in Britain. The young Vernon Richards, born Vero Recchioni, the son of an old comrade of Errico Malatesta, began to bring out Spain and the World, which Keell anointed as the true successor to Freedom (a dissident group had been publishing a rival Freedom). With the Nationalist victory Spain and the World was for six issues renamed Revolt!, becoming War Commentary for the duration of the Second World War and taking in 1945 the famous title of Freedom. In 1937 Richards had been joined in London by Marie Louise (originally Maria Luisa), daughter of the Italian anarchist philosopher, Camillo Berneri, assassinated in Barcelona that year, almost certainly by the Communists. The brilliantly gifted Marie Louise Berneri was said to be ‘the principal theoretical influence’ behind War Commentary and Freedom – until her wastefully premature death in 1949. The anarchist movement throughout the world can hardly be said to have increased its influence during the decade…Yet the relevance of anarchist ideas was never so great….For the anarchists the problem of the nineteen-sixties is simply that of how to put anarchism back into the intellectual bloodstream, into the field of ideas which are taken seriously. During the 1940s War Commentary followed by Freedom had been fortnightly, but from 1951 the paper went weekly (until 1975 when fortnightly production was resumed). Richards’s hope was always for a daily newspaper! 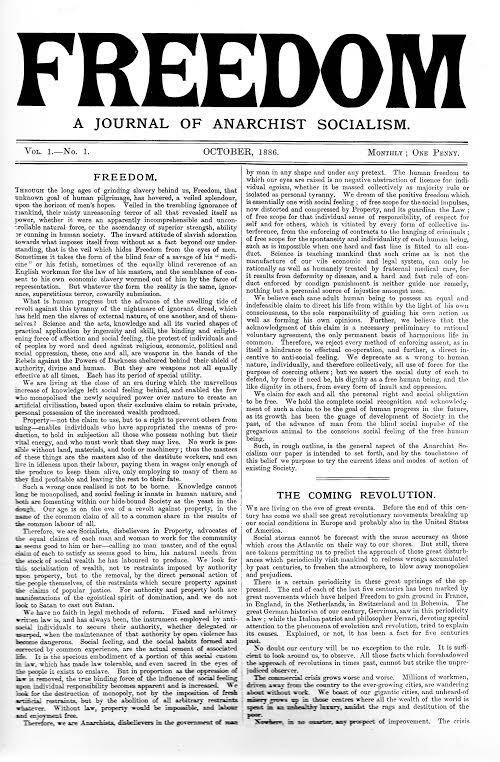 It was to break from the treadmill of weekly production that Ward began to urge the case for a monthly, more reflective Freedom; and eventually his fellow editors responded by giving him his head with the monthly Anarchy in 1961, while they continued to bring out Freedom for the other three weeks of each month. Anarchy ran for 118 issues, culminating in 1970, with a series of superb covers by Rufus Segar. Sales never exceeded 2,800 per issue, no advance on Freedom’s 2,000–3,000. I am told that in Oxford during the 1970s members of the then anarchist group had no interest in Freedom, none reading it. It was quite different ten to fifteen years before. 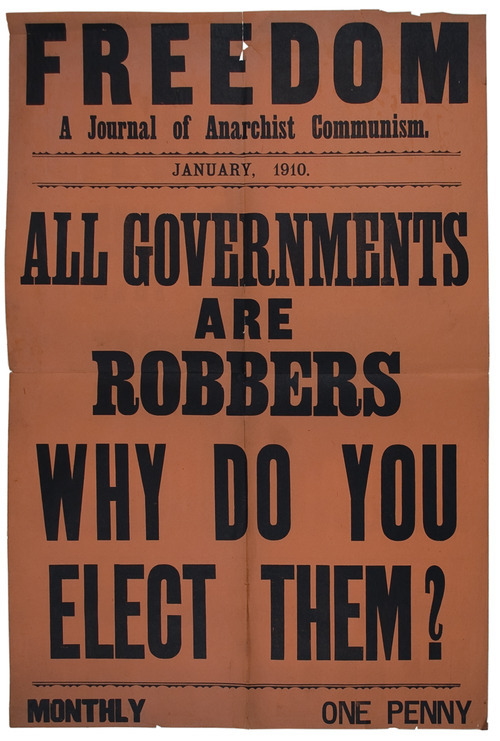 We were conscious of being part of an anarchist revival; admired Freedom Press especially for Anarchy but even for Freedom and the books and pamphlets it published; and Freedom afforded a connection with the remnants of the old workers’ movement scattered throughout the two hemispheres. I was always fascinated by the repeated donations to the ‘Deficit Fund’ raised by anarchist picnics in various parts of the USA: the family backgrounds of Richards and Berneri induced fierce loyalty among anarchists of Italian origin. And at the bookshop in Maxwell Road, Fulham, one would meet none other than Lilian Wolfe, by then living in Cheltenham but spending the week working for Freedom in London. I can see, though, that Freedom’s lack of interest in good graphics and artwork (unlike the New Left publications, as well as International Socialism and Pluto Press, and Black Dwarf) would be especially off-putting to post-sixties anarchists – Segar’s talents were only employed on Anarchy. In fact, I also became very critical of this visual philistinism. Yet when Peter Marshall and I were negotiating with Richards in the late eighties about a quarterly successor to Anarchy – our working title was Transformation – insisting on the need for good design, we were told very firmly that it didn’t matter how tatty the production was since it was the words alone which were important. Peter and I were not involved with the resulting Raven, the first seven numbers of which were edited with considerable distinction by Heiner Becker and Nicolas Walter. Heiner was to tell me with great bitterness, though, that he and Nicolas had received no word of praise or even thanks from Vero Richards. It was Richards who, for both good and ill, was the principal force behind Freedom following Berneri’s death. He was to withdraw from both the editorship of the paper and running his parents’ Soho grocery shop to an organic market garden on the border of Essex with Suffolk; but he continued to take a close interest in the running of Freedom, intervening directly whenever he thought essential until his official retirement from its affairs in 1995. There had been for several decades an acrimonious dispute with Albert Meltzer, originally a loyal member of the Freedom Press Group in the late 1940s and early 1950s, who brought out the cantankerously militant Black Flag from 1970 in opposition to Freedom. After Meltzer’s death in 1996 and Richards’s in 2001 the supporters of the opposing papers reached a very welcome rapprochement, yet this did not provide Freedom with a necessary fillip and, ironically, Black Flag expired as a monthly several years before its rival. It was, then, the passing of Vernon Richards which contributed decisively to Freedom’s decline. To the end there was usually in each issue at least one article or report well worth reading. For many years (until his death in 2000) this might be by Nicolas Walter, whose name always signified quality, or Ward’s ‘Anarchist Notebook’ column. The nurturing of Colin Ward’s talent was possibly Freedom’s greatest achievement, Freedom Press publishing no fewer than nine of his books. Do I have to add that I consider the Freedom of Richards and Ward to have originated in 1936 with Spain and the World, not Kropotkin’s and Wilson’s journal of 1886? A reader of Freedom since 1961, a continuous subscriber from the following year, I am one of the bereaved. Over half-a-century I have been as much Marxist as anarchist, sometimes a good deal more so. But I have never been more convinced as to the need of libertarian solutions to our current predicaments in all parts of the world. The demise of a hardcopy Freedom is likely to make this necessity that much more difficult to achieve. David Goodway‘s publications include London Chartism, 1838-1848 (1982), Anarchist Seeds beneath the Snow: Left-Libertarian Thought and British writers from William Morris to Colin Ward (2006, revised edition 2012). He edited For Anarchism: History, Theory, and Practice, published in the History Workshop Series in 1989. His edition of G.J. 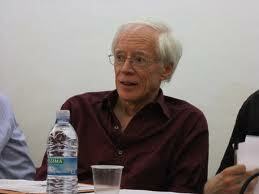 Harney’s late journalism, The Chartists were Right, is being published shortly by Merlin. The best source for the history of Freedom is Freedom: a hundred years, an eighty-eight page centenary edition of the journal published in October 1986 and containing articles by, among others, Heiner Becker, Nicolas Walter and Vernon Richards. Donald Rooum, ‘Freedom, Freedom Press and Freedom Bookshop: A Short History of Freedom Press’, Information for Social Change, no. 27 (Summer 2008). There’s so much accumulated wisdom, commitment and political energy in a journal as old as Freedom, it is sad to see it go – and surprising when the Anarchist Book Fair is so thriving, and when libertarian ideas are at least the match for statist ideologies on the left. It is hard to argue with the economics of the current Freedom group’s decision. Much as I love print people tend to access the left press online, in larger numbers by far than in print especially as our high postal costs make for high subscription costs. The editors have struggled to come out to deadline, another reason subscriptions fell away. In the absence of places and people to actually sell the magazine it seems to me to be a regrettable but sensible decision. Of course, just as the title itself and the frequency has come and gone a later editorial committee could change the decision! Back in the day, I used to sell Freedom and Peace News at demonstrations and kept a residual loyalty to both, even when I was in the Labour Party. Freedom has been irrelevant for the last 40 years. No one will really notice its demise outside of a few anarchists. The problem is that, for many years now, Freedom has been run by dimwits. It has had nothing of value to say for a long while. It is such a shame that this historically important paper has been ruined and left to fold. Just re-read “Freedom Press being unswervingly hostile to the Labour governments and their nationalization and welfare legislation.” In recent years, every edition of Freedom was anti-denationalisation and pro-welfare. It was often difficult to tell it apart from a left Labour paper except for the juvenile photos of people in masks throwing things at the police. demise of a hardcopy Freedom’ is likely to make the possibility of achieving libertarian solutions to the myriad problems posed by capital and the state, any harder? New technologies are making the print media increasing moribund. The answer is clear: “New technologies” are far more easily censored. The administrator of any blog can shut it down–or be pressured to do so–and that, more or less, is that. Whereas, once you have 5,000 copies of a print publication out and circulating, it’s almost impossible to get rid of every single one.